HackSpace magazine is the magazine for anyone who likes building things. Each month, there are 132 pages packed full of the best features, projects, and inspiration from the making scene, covering modern techniques such as digital making, 3D printing, and laser cutting, as well as traditional crafts such as blacksmithing and crochet. 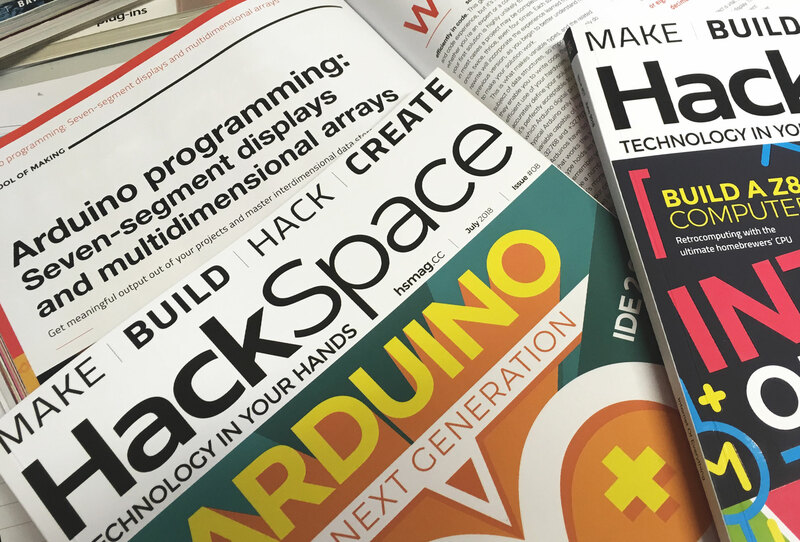 Available either printed on premium paper, designed to withstand a workshop environment, or as a digital download, HackSpace magazine has quickly established a name for itself as one of the foremost resources for the modern maker. Launched in late 2016, our brief was to create a brand new ‘grown-up’ monthly magazine aimed at the growing army of home makers. Starting with the logo and developing the design through the template, we created a modern ‘spacious’ style, perfectly pitched to really show off each project and to enable readers to be enthused & educated in equal measure. As a monthly title, we manage the design and creative direction of HackSpace magazine as an ongoing project, taking care to ensure the magazine continues to offer its readers clear, well designed pages appropriate to the subject and magazine style. HackSpace Magazine also benefits from some awesome print production; using a lovely thick outer cover that we add a soft touch matt laminate to and include a spot UV over the top – looks awesome!!! !